Submit a story for a special “Doors Open” StorySlam! Do you know someone who always has great stories about Milwaukee neighborhoods? Or do you have stories about Milwaukee spaces? 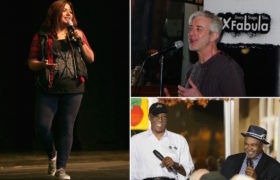 Ex Fabula and Historic Milwaukee are partnering to present a Milwaukee neighborhood inspired StorySlam on Saturday September 17 and we’re looking for a few storytellers! We’ll accept applications through July 31 and announce the lineup in mid August. No storytelling experience is needed, but storytellers should be willing to do some preparation on their own. Ex Fabula will provide free entry to a storytelling workshop, a free session with a storytelling coach, and some free tickets to the event. Sorry, the application process has concluded for this event! This event will take place at the Wisconsin Black Historical Society and Museum, which has a great story of its own. Started in 1987, it began on the premise that those who know their history will grow to love and appreciate themselves more. Located on 27th and Center Streets, the WBHSM works to bridge the gap between future and past and also serves as a resource center for those interested in learning more about Wisconsin’s rich African American heritage. Tickets and more details will be available in August.